As expected, the Israeli-Arab conflict has been a major foreign policy campaign topic in the run-up to the 2012 US presidential election. And of the many Republican candidates vying for the chance to challenge President Barack Obama at the polls, Representative Ron Paul (R-TX) is widely viewed as by far the most anti-Israel. Paul's campaign spokesman, Gary Howard, emailed the media last week to insist that, in fact, the opposite is true. "Dr. Paul is the most pro-Israel candidate in this race," Howard stated. 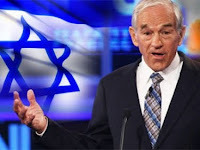 For years, Paul has preached an isolationist foreign policy that would see the US end its financial aid to and its special diplomatic support of Israel. In addition, a former Paul campaign aide, Eric Dandero, revealed to reporters recently that Paul doesn't like Israel and "wishes the Israeli state did not exist at all." But Howard tried to put all of that in context, pointing out that regardless of Paul's personal views on Israel, his isolationist policies would extend to every nation, including Israel's enemies. "He is the only leader who will stop sending tens of billions of dollars in aid and arms to her Arab enemies, cut off subsidies to companies who do business with Iran, and allow Israel to defend herself as she sees fit, without the permission and interference of the U.S. or the United Nations," wrote Howard. By contrast, Paul's top competitors for the Republican presidential nomination have all vowed to increase American support for Israel if they are elected. Many Israelis and Americans argue that US financial and military aid is what allows the Jewish state to maintain a qualitative edge over its enemies, and therefore deter existential threats. Others argue that the US aid is ultimately a burden that more often than not forces Israel to mold its policies to please the White House. Those who like to argue against massive American aid often point out that 1948, 1967 and 1973 Israel won full-scale wars against multiple Arab enemies bent on its destruction without the benefit of enormous American aid it enjoys today. Bible-believers recognize those past victories as evidence that with or without America's help, Israel would still overcome any existential military threat. According to the Bible, the real loser should America's support of Israel falter would be America itself.